Jurisdiction to prosecute civilians in military courts 2018 Israeli Military Court's Unit Updated briefing document produced by the Militayr Court's Unit referring to Article 66 of the Fourth Geneva Convention as the jurisdictional basis for prosecuting Palestinian civilians, including children, in military courts. Jurisdiction to prosecute civilians in military courts 2017 Israeli Military Court's Unit Updated briefing document produced by the Military Courts Unit referring to Article 66 of the Fourth Geneva Convention as the jurisdictional basis for prosecuting Palestinian civilians, including children, in military courts. Application of Fourth Geneva Convention 2016 UK Foreign and Commonwealth Office The UK Government again confirms the application of the Fourth Geneva Convention to the Occupied Palestinian Territories and the unlawful nature of transferring and detaining Palestinians from the West Bank inside Israel. Jurisdiction to prosecute civilians in military courts 2015 Israeli Military Court's Unit Briefing document produced by the Military Courts Unit expressly relies on Article 66 of the Fourth Geneva Convention as the jurisdictional basis for prosecuting Palestinian civilians in military courts. Jurisdiction of the International Criminal Court 2014 Fatou Bensouda, ICC prosecutor The prosecutor at the ICC explains why it is still up to the Palestinian Authority to activate the Court's jurisdiction. Third Party Obligations with respect to Israeli Settlements in the Occupied Palestinian Territories 2012 James Crawford S.C. The legal obligations (at an international, European and UK level) facing European states (specifically the UK) regarding their support for and involvement with Israeli settlement activity in the West Bank. Greg Davies, Jayne Harrill, Marianna Hildyard QC, Judy Khan QC, Jude Lanchin, Marc Mason, Frances Oldham QC, The Rt Hon Baroness Patricia Scotland of Asthal QC (former Attorney General of England, Wales and Northern Ireland), The Rt Hon Sir Stephen Sedley (formerly Lord Justice Sedley). The advisory opinion of the ICJ on the legality of the Wall. The Court considers the applicablity of the Fourth Geneva Convention and the human rights treaties to which Israel is a party to the population in occupied Palestine. 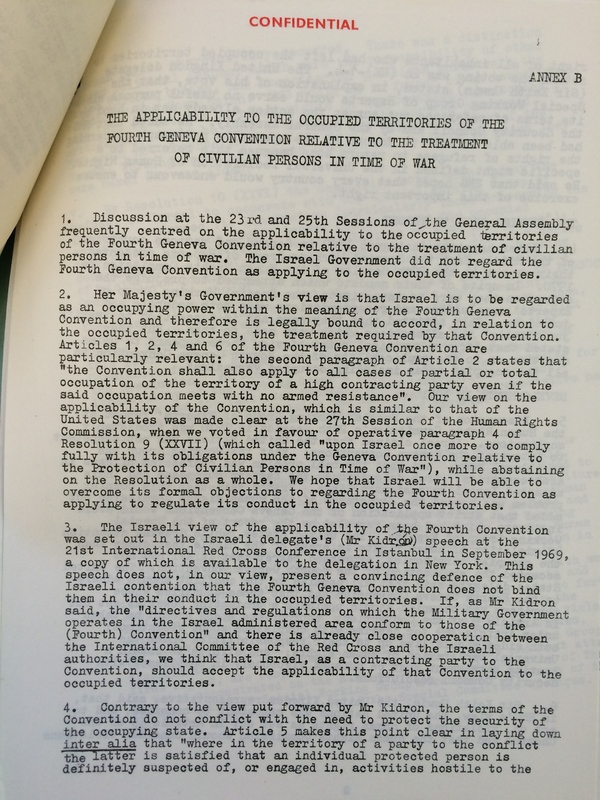 Applicability of the Fourth Geneva Convention to the Occupied Territories 1971 UK Foreign and Commonwealth Office Her Majesty's Government's view is that Israel is to be regarded as an occupying power within the meaning of the Fourth Geneva Convention and therefore is legally bound to accord, in relation to the occupied territories, the treatment required by that Convention. Geneva Convention: Blasting Homes and Deportation 1968 T.Meron, Legal Advisor, Israeli Ministry of Foreign Affairs Government legal opinion regarding legality of home demolitions and deportation. Government legal opinion regarding Israeli settlement construction in occupied territory.